Once A Rez Boy, Now A Hero! 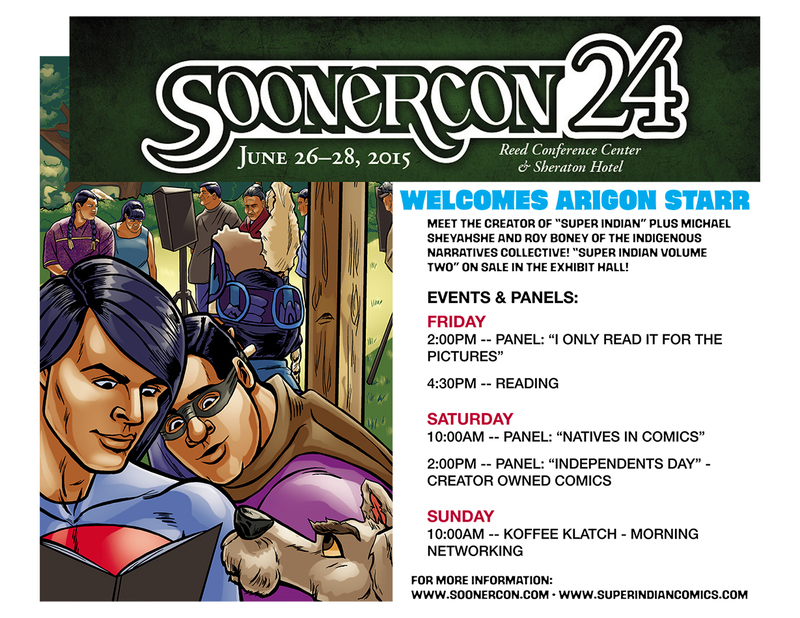 For the very first time, Arigon Starr will be part of the programming and exhibit hall at the upcoming SoonerCon in Oklahoma City. The conference takes place Friday, June 26th through Sunday, June 28th at the Reed Conference Center in Midwest City. Admission/Membership is available online via the SoonerCon website. Prices are $25 Daily or $50 for the entire weekend. Children under 12 are free as long as they are accompanied and supervised by an adult. Arigon will be a several different panels throughout the conference, in addition to being part of the Indigenous Narratives Collective booth in the exhibit hall. She will have copies of “Super Indian” volumes One and Two, in addition to some special prints featuring images from “Super Indian” and the fun “Jimi Black” movie poster. Here’s the flyer with more detailed information. Please share with your friends and family and Arigon looks forward to meeting you at the Con! Next Super Indian Garners Awards and Prestigious Shout Outs! Minorities in Publishing Podcast Features Arigon! Happy 2018! New Comics Coming Soon! ©2007-2018 Wacky Productions Unlimited. All Rights Reserved. Want to know more about Arigon Starr and Super Indian? Enter your email address to subscribe to this blog and receive notifications of new posts by email.